Update (3:30 pm ET): Might Theresa May have cause for optimism? According to reports breaking late in the day in London, ERG leader Jacob Rees-Mogg who has been slowly warming to May's deal, reportedly told the DUP that he would be willing to back May's deal if the DUP agreed. The decision would presumably help the Brexiteers cut off any chance of a pivot to a 'softer' Brexit...or a much longer delay. If the DUP could agreed, Rees-Mogg could "hold his nose" and vote for the deal. A source close to Jacob Rees-Mogg confirms he is ready to back May’s deal conditional on DUP support. He believes Brexit is in danger and he now thinks the deal is the least bad option. Says if the DUP can support it then he can hold his nose and vote for it. Update (1:30 pm ET): A spokesman for No. 10 said May could ask for a longer Article 50 extension if her deal isn't passed. Meanwhile, John Bercow has selected a handful of amendments - including Letwin's call for a series of indicative votes - to be brought for a vote in the Commons. Bercow chooses amendments tabled by Oliver Letwin, Jeremy Corbyn and Margaret Beckett. No Yvette Cooper though. Bit of a surprise. 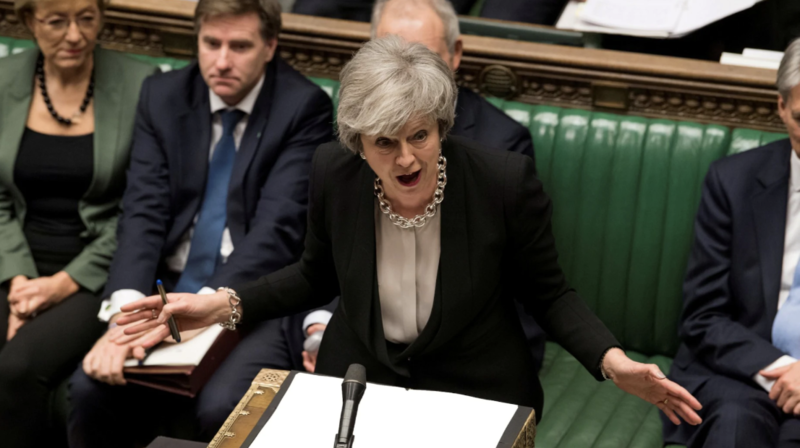 Update (11:50 am ET): Offering her first public remarks since she survived the latest pressure campaign to oust her in favor of a caretaker prime minister, PM May offered no obvious paths forward for the UK as it stumbles toward the already-delayed Brexit Day. May acknowledged that she doesn't have the support to pass her withdrawal agreement, and therefore will hold off on a third meaningful vote. May added that she's skeptical of holding an indicative vote, because the EU likely wouldn't agree to any changes embraced by MPs. May fears MPs might pick a "unicorn." She later added that she opposes a public vote on her Brexit plan, suggesting that a referendum is off the table. Parliament will debate secondary legislation to change the Brexit deal on Wednesday (though, again, it's unlikely that the EU would even accept a different deal, even the 'softer' Brexit that the ERG fears May might pivot to). In other words, the only thing that could avert a 'no deal' exit - or a lengthy Brexit delay - would be the DUP and ERG conceding and agreeing to vote for May's deal (and even that wouldn't guarantee it passing). 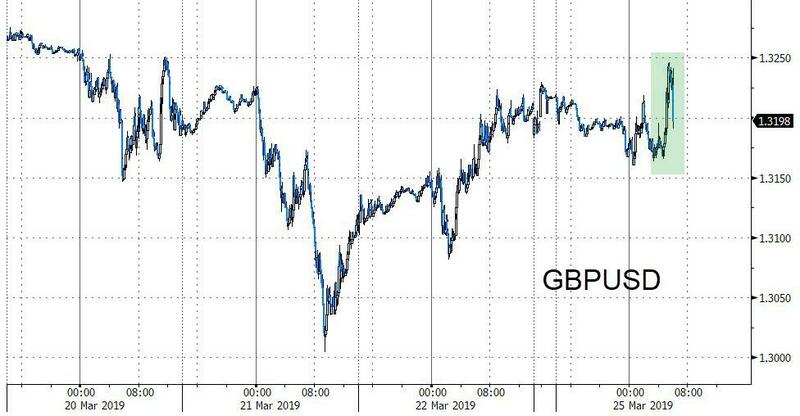 Update (10 am ET): The latest batch of Brexit reports suggested that May could move ahead with holding MV3 as early as Tuesday evening...regardless if there's enough support for the deal to pass. Update (9:20 am ET): A spokesperson for No. 10 Downing Street has confirmed that the prime minister won't call for another meaningful vote on her Brexit plan unless she can win the vote (which of course doesn't look likely), and that the government won't push for a series of indicative votes until after that issue has been decided. However, even with May holding out hope that her deal might be passed after the latest attempt to push her out fizzled over the weekend, it doesn't look like she'll manage to win the votes she would need to finally pass her withdrawal agreement, with the DUP saying Monday that they wouldn't support the deal if it is brought for a third vote. Asked what they believed might happen, a DUP official told BBG that May has 'no chance' of getting her deal through, and that a no-deal Brexit remained the most likely outcome (despite MPs rejecting it during an indicative vote earlier this month). The pound has reversed an earlier bounce on the latest batch of headlines. Meanwhile, the EU said Monday that it's members are prepared for the UK to exit without a deal, and that hundreds of customs specialists have been recruited to make sure any disruptions in the flow of goods doesn't last more than a few days. One EU official added that the bloc wouldn't enter into "mini-deals" to make no-deal more palatable. Cabinet sources have told the FT that May would whip votes against the Letwin amendment, which would call for a series of indicative votes on alternatives to May's deal. The leading Brexiteers have made a lot of noise demanding that Prime Minister Theresa May should resign. But during a hastily organized Sunday summit at Chequers, the prime minister's country house, May forced them to acknowledge a simple, if unpalatable fact: That the Tories, having already failed to oust her in a no confidence vote, have no obvious alternative for deposing May. Yet, in a sign that exhaustion with the interminable Brexit nightmare is swiftly setting in, the Prime Minister has reportedly decided to offer the group, which includes Boris Johnson (who penned a weepy Telegraph op-ed lambasting May and calling for the PM to step down), Jacob Rees-Mogg, Iain Duncan-Smith, Steve Baker, David Davis (the former Brexit Secretary) and others, a marginally attractive deal: Back MV3 - that is, a third meaningful vote on the withdrawal agreement (remember, the last two were defeated by historic margins) - and May will commit to resigning. Some might ask: Hasn't May already promised to resign? Yes, but not until some still-undetermined date before the next general election. But a bigger issue is that neither side has a whole lot of trust in the other. May has reportedly refused to serve up her own head until the vote has passed (for fear of an 11th-hour betrayal), while the ERG (the parliamentary group of roughly 70 conservative backbenchers) and DUP (the 10 MPs from Northern Ireland who have allied with the ERG in opposing May's deal) are hesitant to back the deal over concerns May might renege on her promise. May offering herself for ritual sacrifice on the Brexiter altar, the ERG Brexiters and DUP may well say thank you very much, and vote against her anyway. Why should they compromise their principles, and alienate their loyal supporters, for May’s doomed project? At this point, the backing of ERG leaders and the DUP might not even be enough to push the deal through. As Peston points out, the PM has alienated too many opposition MPs and loyalist remainers. But regardless of what the cabinet decides, a cross-party group of rebel backbenchers, led by Tory MP Sir Oliver Letwin, might very well force one anyway by seizing control of the Commons - and they might succeed, in a vote that's expected as soon as Monday evening. However, the indicative vote plan has a major flaw (which is probably why it hasn't already been tried, at least not in earnest): Despite all of the squabbling and intraparty infighting, there has never been a credible alternative to the withdrawal agreement. Which is one reason why, as Peston ponted out, Johnson and the other hard-core Brexiteers might be preparing for "the mother of all u-turns": Possibly agreeing to back May's deal in exchange for her resignation and commitments involving the talks over the future trade deal, which would take place during the transition period. Whatever happens, May is expected to address MPs in the Commons just after 3:30pm London Time (11:30 am ET), with votes on Brexit amendments expected to take place at 10 pm (6 pm ET), as the countdown until April 12 - the new Brexit Day - continues.